The Kid’s favorite flavored treat is red velvet. Everywhere you go nowadays it seems there’s red velvet. Starbucks has cake balls, Barnes & Noble has cupcakes. They even have a coffee creamer. I’ll admit that creamer almost got me, but I managed to resist. My donut pan was one of the better purchases I’ve made for the kitchen in a long time and it gets a ton of use. My favorite is still the dark chocolate baked donuts, but judging by The Kid’s reaction these are worth a try. They get my vote from ease of baking since it uses pre-boxed cake mix. Preheat oven to 350 degrees and spray a donut pan with non-stick spray. Mix the almond milk and vinegar in a small bowl and set aside for 5 minutes to sour. Once the milk is curdled, mix all ingredients in a bowl until well blended. Fill each donut well 1/2 to 2/3 full. Bake at 350 degrees for 10 minutes. Remove from oven and cool for 5 minutes before removing from pan. Repeat with remaining batter. 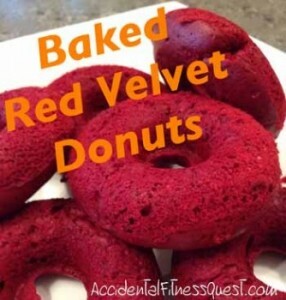 Makes approximately 10 donuts at 112 calories each – 1.7g protein, 39.7g carbs and 3.6g fat. You can use buttermilk instead of the almond milk/vinegar combination. I just find that souring milk when I need it is much easier than figuring out what to do with a carton of buttermilk. You can use soy milk or regular milk in place of the almond milk with the same results. I’ve tried baking with each and not had any issues. You can use vegetable or canola oil in place of the coconut oil. I just used the oil that I had on hand. The kid ate her donuts plain, but you can toss them while they are warm in powdered sugar. You can also frost them with cream cheese frosting or marshmallow fluff for an even sweeter treat. If you’re attempting to eat 100% clean, these won’t qualify but they’re nice for an occasional treat. I bet these would be good with other flavors of cake mix so experiment and let me know how it works out.